Sciatic nerve schwannomas represent less than 1% of all schwannomas. The nerve might be affected by the tumor all along its course. Among all the benign sciatic nerve tumors, 60% are represented by neurofibroma and 38% are schwannomas. In general, schwannomas have a predilection for the head, neck, mediastinum, and retroperitoneal regions whereas involvement of the sciatic nerve is very rare. 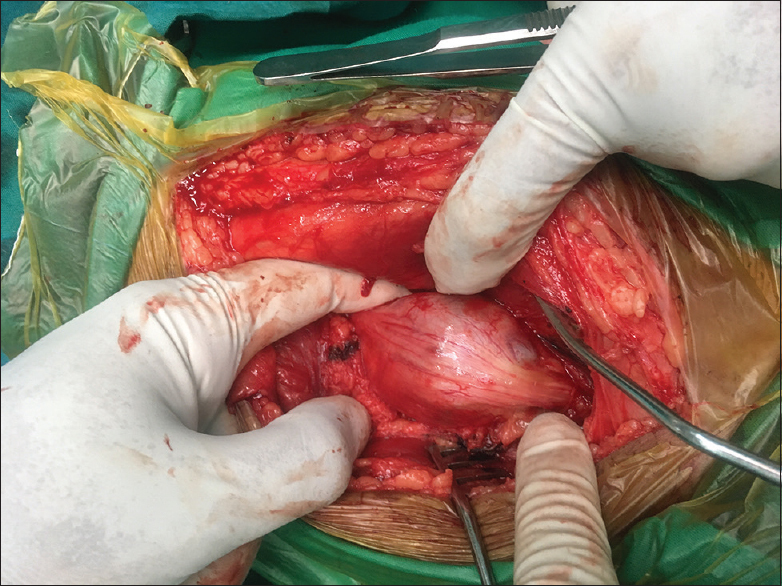 Here, we present a case of sciatic nerve schwannoma in a young male subject who presented with a swelling in the back of the left thigh associated with persistent sciatica. A 34-year old male patient presented in our neurosurgery outpatient department with pain and swelling in the back of the left thigh for 1 year. His neurological examination was within normal limits except for a positive Tinel's sign. A contrast-enhanced magnetic resonance imaging (CEMRI) revealed a well-defined, encapsulated, contrast-enhancing mass involving the sciatic nerve, which was hypointense on T1-weighted and heterogeneously hyperintense on T2-weighted images with heterogenous contrast enhancement [Figure 1]a and [Figure 1]b. The patient was posted for microscopic surgical excision under general anesthesia. The patient was positioned in a prone position and a linear skin incision was made over the swelling. 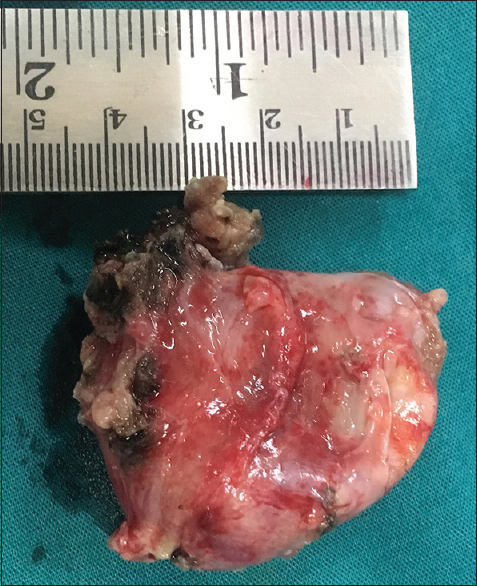 A well-circumscribed, firm, encapsulated tumor was seen originating from the sciatic nerve sheath displacing the fascicles [Figure 2]. The tumor measured 50 × 40 × 30 mm and infiltrated the sciatic nerve for a length of 4 cm. We exposed the sciatic nerve proximal and distal to the swelling. The nerve sheath was opened and the tumor was dissected from the nerve fascicles, which were incorporated within the tumor capsule. We achieved total resection and preserved the anatomic integrity of the sciatic nerve [Figure 3]. The outcome was favorable with no postoperative deficits. On follow-up at 6 months, the patient had no residual pain and no sensory or motor loss. On gross examination, the mass was oval shaped with an irregular surface and was firm in consistency [Figure 4]. Microscopic examination of the lesion revealed densely packed spindle cells arranged in Antoni type A and Antoni type B areas [Figure 5]. On immunohistochemistry, the tumor cells were S-100 positive, confirming a neural origin. The neoplastic involvement of the sciatic nerve has been reported in soft tissue malignancies, sarcoidosis, lymphoma, and infiltrating intermuscular lipoma; however, sciatic schwannomas are rare. Usually, schwannomas are solitary, well-circumscribed, encapsulated tumors, eccentrically located on nerve roots, and originate from proximal nerves or spinal nerve roots. They arise from a single fascicle and grow circumferentially displacing the other fascicles within the nerve sheath. Schwannomas have a long subclinical course and their clinical presentation is usually misleading. Pain due to sciatic nerve schwannomas may simulate sciatica pain caused by a prolapsed lumbar disc. The physical examination may reveal the presence of a lump along the course of the sciatic nerve, which may be tender and has significant mobility along the transverse axis but limited mobility along the course of the nerve, and with a typical positive Tinel's sign. Magnetic resonance imaging (MRI) enables the differentiation between schwannomas and neurofibromas. 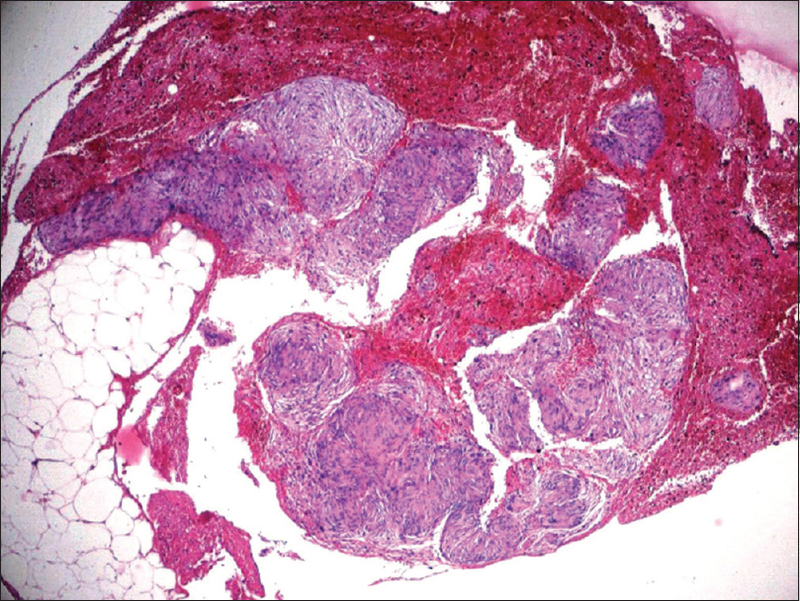 Schwannomas are fusiform shaped with characteristic tapering cephalad and distal ends, accompanied by the fasciculation sign and the split fat signs., The mass is located eccentrically, is well circumscribed, and shows an isointense signal on T1-weighted images, with a peripheral hyperintensity and a homogenous hypointense centre on T2-weighted images. Neurofibromas are usually heterogeneous or rarely homogeneous on both T1- and T2-weighted images. Schwannomas are composed of two organized cell patterns: Antoni A and Antoni B. The Antoni A pattern is more organized with a palisaded appearance and an elongated, spindle-shaped cellular nucleus. A characteristic appearance in the Antoni A pattern is the Verocay body, which is a circular coalescence of elongated nuclei. The Antoni B pattern is characterized by a diffuse cellular structure with rounded nuclei. This palisaded arrangement is not unique to schwannomas. Surgery is the treatment of choice in peripheral nerve schwannomas. In small tumors, extracapsular microscopic resection along with gentle dissection of nervous fibers from the tumor capsule is the treatment of choice. Nerve fascicles stretch over the tumor capsule. The surgeon must identify all intact fascicles over the capsule. The nerve and tumor must be carefully isolated and dissected from all adjacent neurovascular and soft tissue structures. The nerve sheath is opened only after a wide exposure. The nerve fascicles are divided and the tumor is resected. Longitudinal dissection of the nerve sheath is prohibited because it cuts off the vascular supply of the sciatic nerve. In large tumors, extracapsular excision cannot be achieved due to the tumor size, necessitating an intracapsular debulking first. In the cases where functional fascicles cannot be dissected from the capsule, it is wiser to leave a residual tumor than produce postoperative deficits. 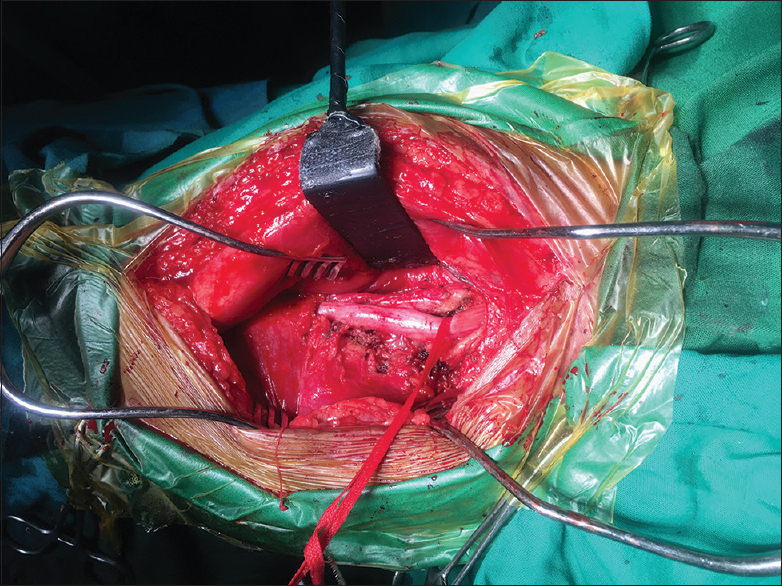 Surgery in peripheral nerve sheath tumors tends to be extremely satisfactory when strict surgical principles are applied., In a great majority of peripheral nerve schwannomas, total tumor resection without significant residual neurologic deficits can be achieved. Schwannomas have a good prognosis and a low incidence of recurrence even when the excision is incomplete. A few studies mention recurrence following excisional resection., Malignant transformation in schwannomas is rare, the risk being approximated at 18% in neurofibromatosis type 1 and 5% in schwannomas. Our patient presented with pain along the back of the left thigh, which can be easily misdiagnosed as a case of sciatica caused by a herniated lumbar disc. There were no features of neurofibromatosis-2 in our patient. To conclude, sciatic nerve schwannomas, though rare, should be borne in mind while dealing with patients who are presenting with sciatica. A schwannoma is a benign neoplasm and MRI imaging of the nerve is prudent for diagnosing the lesion. It is imperative to outline the course of the nerve and to delineate the boundary of the lesion to preserve the nerve fascicles. This can be facilitated by performing the excision under a microscope. Preserving the integrity of the sciatic nerve together with fascicles which have not been infiltrated by the tumor, assures a favorable outcome, without the development of any additional neurological deficits. Blanchard C, Dam-Hieu P, Zagnoli F, Bellard S. Chronic sciatic pain caused by sciatic nerve schwannoma. Rev Med Interne 2008;29:748-50. Rekha A, Ravi A. Sciatic nerve schwannoma. Int J Low Extrem Wounds 2004;3:165-7. Gorgan M, Sandu AM, Bucur N, Neacsu A, Pruna V, Voina A, et al. Sciatic nerve schwannoma: A case report. Rom Neurosurg 2008;XV: 27-31. Linder J. Diseases of the skin and connective tissues. In: Damjanov I, editor. Anderson's Pathology. 10th ed. St. Louis: Mosby; 1996. p. 2508. Jayendrapalan J, Ramesh VG, Karthikeyan KV, Devi S. Primary lymphoma of the radial nerve presenting as nerve sheath tumor. Neurol India 2018;66:258-60. Feinberg J, Sethi S. Sciatic neuropathy: Case report and discussion of the literature on postoperative sciatic neuropathy and sciatic nerve tumors. HSS J 2006;2:181-7. Li CS, Huang GS, Wu HD, Chen WT, Shih LS, Lii JM, et al. Differentiation of soft tissue benign and malignant peripheral nerve sheath tumors with magnetic resonance imaging. Clin Imaging 2008;32:121-7. Wasa J, Nishida Y, Tsukushi S, Shido Y, Sugiura H, Nakashima H, et al. MRI features in the differentiation of malignant peripheral nerve sheath tumors and neurofibromas. AJR Am J Roentgenol 2010;194:1568-74. Suh JS, Abenoza P, Galloway HR, Everson LI, Grifths HJ. Peripheral (extracranial) nerve tumors: Correlation of MR imaging and histologic findings. Radiology 1992;183:341-6. Oberle J, Kahamba J, Richter HP. Peripheral nerve schwannomas - an analysis of 16 patients. Acta Neurochir 2005;139:949-53. Garozzo D. Peripheral nerve tumors in neurofibromatosis: An overview on management and indications for surgical treatment in our experience. Neurol India 2019;67:S38-44. Wilson AG Jr, Hofmeister EP, Thompson M. Recurrent schwannoma with bony erosion of the distal middle finger. Am J Orthop (Belle Mead NJ) 2007;36:E37-9. Strickland JW, Steichen JB. Nerve tumors of the hand and forearm. J Hand Surg Am 1977;2:285-7. Weiss SW, Goldblum JR. Benign tumors of peripheral nerves and malignant tumors of peripheral nerves. In: Enzinger and Weiss Soft Tissue Tumors, 4th ed. London: Mosby, St Louis; 2001. p. 1111-322.